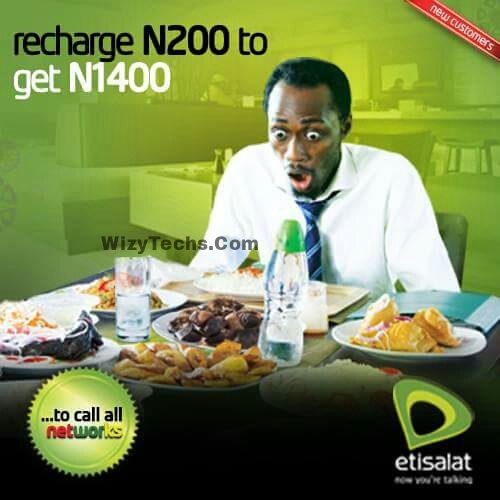 Hello guys, you can now enjoy a massive N1400 Naira airtime with just N200 Naira on the Etisalat network. Network providers are really competing with each others in a quest to win the heart of more customers to their subscribers base and this is to the advantage of you and I. YOU too can start enjoying plenty bonuses today in our #SuperBonusOffer with as low as N100 airtime recharge. This awoof is a one time offer for new Etisalat subscribers. Even old customers can also enjoy it; all you have to to is get a new SIM, register it and recharge, then your bonus will smile at you. Remember MTN double data bonus is still active. In fact, its the best trick to subscribe for data bundles on MTN network. wizy u said old subscribers can also enjoy it.. hw? does it mean if I recharge now wit 200#....1400# will b smiling @ me? Etisalat! One time offer, new Sim. There is God!!!!!! is it only for new subscribers? is there any way d existing users can partake?